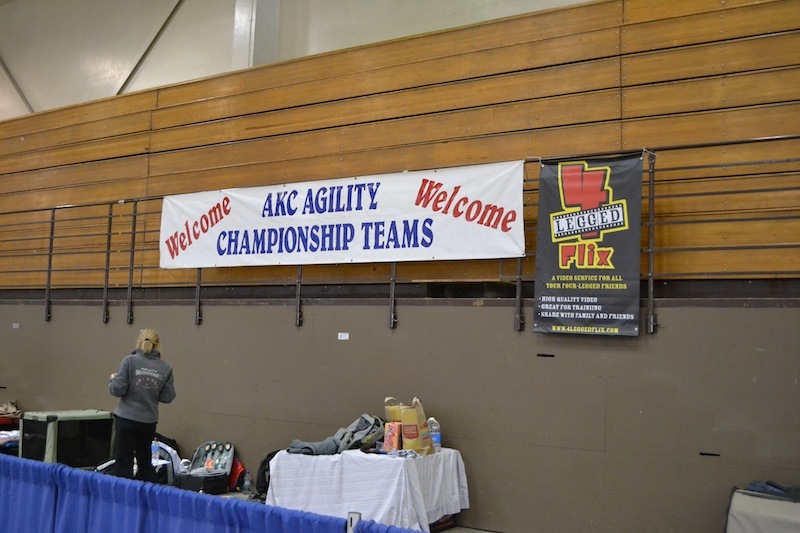 Duncan and I returned from AKC Agility Nationals in Reno early this week. After working all last year to earn our points to go, I wondered if would be worth it. In a word – absolutely. It was most definitely worth the time, the effort and the trip. 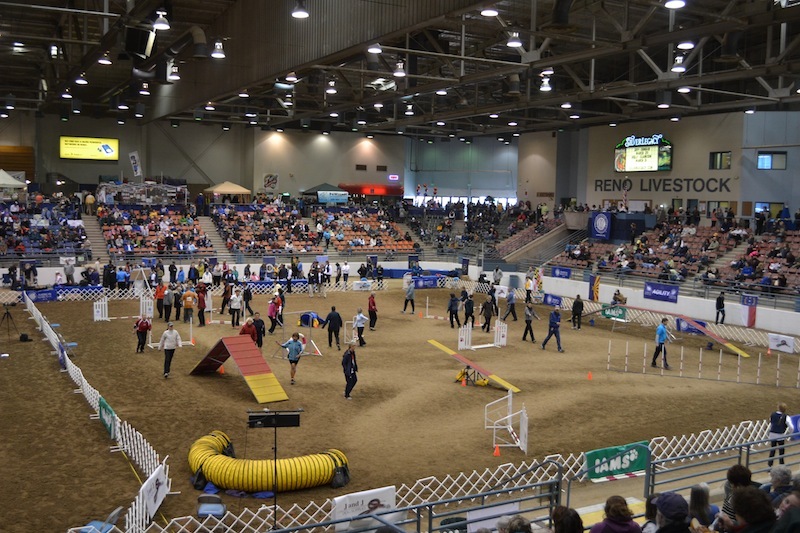 We arrived on Thursday to find three identical courses set on the floor of the rodeo arena. (With a fourth course set in an adjacent arena in another building). At that moment, gazing across the immense space, I realized what a huge deal this was, and was simply happy to be there, having earned the opportunity to run here with Duncan. Thanks to Donna for taking this picture when I didn't! But back to the main event – running! Friday was Time 2 Beat, basically a practice run. Duncan ran beautifully, nice, solid and fast, with no issues. Good thing he had his brain together because I used up all of my energy trying to figure out how to get in the ring. 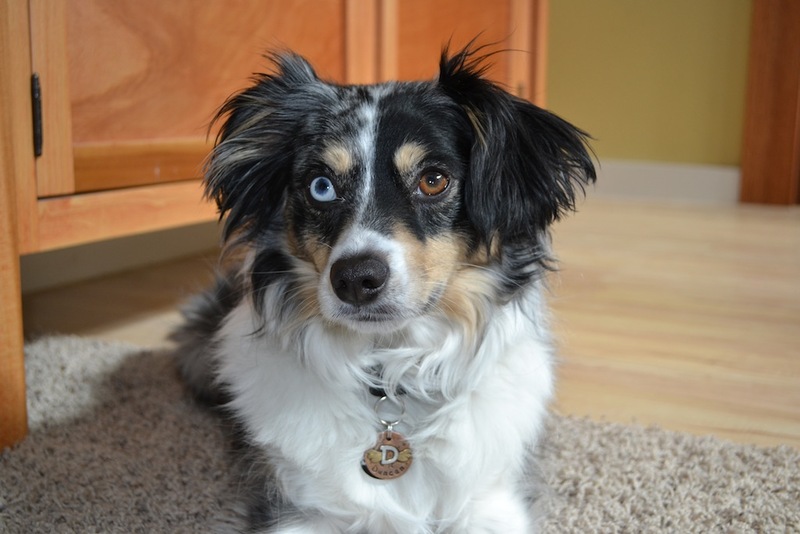 We were given tags with UPC codes to attach to our leashes. As the dog before us crossed the start line, they would scan your tag. Fantastic for knowing which dog was running, terrible for handler focus! But the cool part was that on my way back to the crating area, I could scan our tag and find out our time and score…immediately. They also had the run order updating in the crating area, which was a 5-8 minute walk from the rings, and in a separate building. This was so helpful in knowing when to leave for the rings without having too much time waiting in a crowd ring-side. Early Saturday, Duncan and I got to meet the other 11 Canine Partners running in the NAC. They brought us together for a group photo, and I met several amazing teams who we cheered on through the finals. That day, we ran JWW and Standard (sans table). Dunc had a lovely JWW, and his Standard was again fast and happy. I would throw my support into a campaign to eradicate the boring table from the Standard courses…Dunc loved it! After two combined runs, Duncan was sitting somewhere around 70th place Saturday night. Sunday we ran hybrid. I will admit to doing a crash course in what hybrid was the night before. Basically, take the table and dogwalk from a Standard course, and there you go…hybrid. And finally…we got the Nationals course that I’d been training for. Our three previous courses were great, but not the technical monsters I’d expected to find at the NAC trial. All three early courses flowed fairly well. Sunday morning’s hybrid changed that. At first glance of the course map, I counted three front crosses in the first five obstacles. A huge smile came across my face. Now THIS is nationals!! While Duncan may not have the most speed on course, he is consistent. When the courses go all twisty, he really shines. And shine he did. His speed was steady off the line and built through the run. He ran beautifully for me all weekend, and that last run just was the icing on the Dunkie cake. After we crossed the line, I spent a moment on the arena floor with my boy, taking it all in. We ran 4/4 runs clean. He ran happy in the most chaotic environment he’d ever been in. And not only had he earned his way to Nationals, he’d run an amazing four runs there. 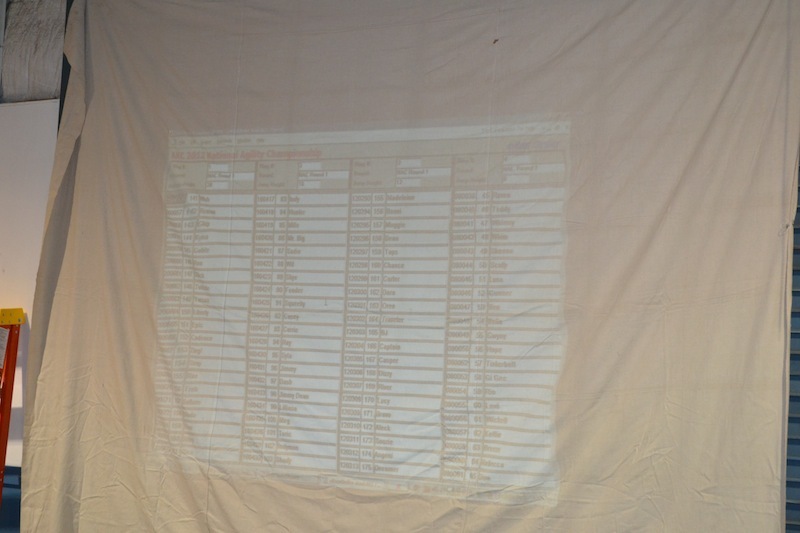 When the final standings came in, Duncan finished his three cumulative runs in 36th place, out of 171 dogs. I am so very proud of how brave, how happy and how amazing this little boy of mine can be. Even better? How great everyone from Idaho and Utah did! Our fantastic traveling partner, Muligan also went 4/4, earning 30th place in the 12″ overall. And our friends in 12″ P and 20″ really rocked, too. Watching the challenger and finals rounds was amazing…I witnessed some beautiful handling, and fantastic teams. Des and I have our work cut out, but I’m definitely inspired! Overall, the experience for me was all about the people and dog friends. My Team Little Dog partner and I had a great trip, and a great trial. I cheered for our Idaho/Utah friends, because no matter the standings, simply running there was an achievement. Once again, I’m simply proud to be part of this crazy dog person world…these are my people, and we are honored to be a part of it. 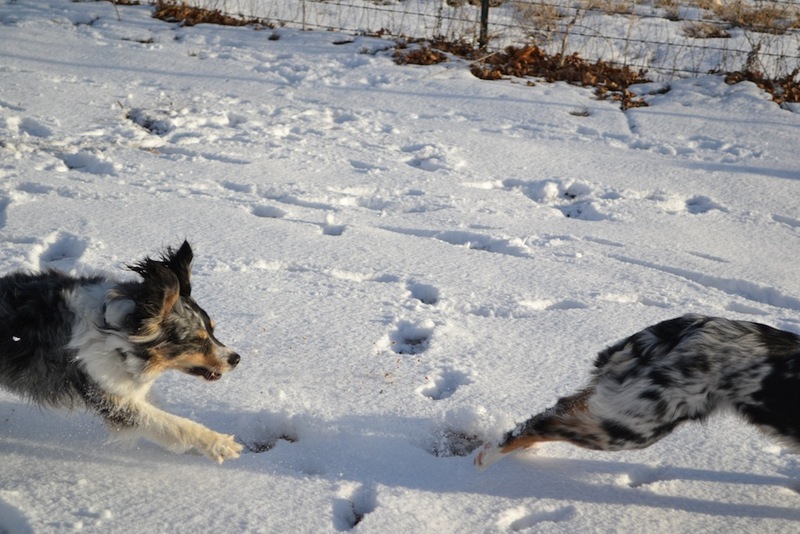 Duncan and I got to run together…in a National trial. That’s all. And that’s amazing! 2011. Eight trials to earn 400 speed points. Many miles, many cookies, many laughs and sometimes a few tears. Days of sun, rain, skipped lunches, and lots of Duncan kisses. 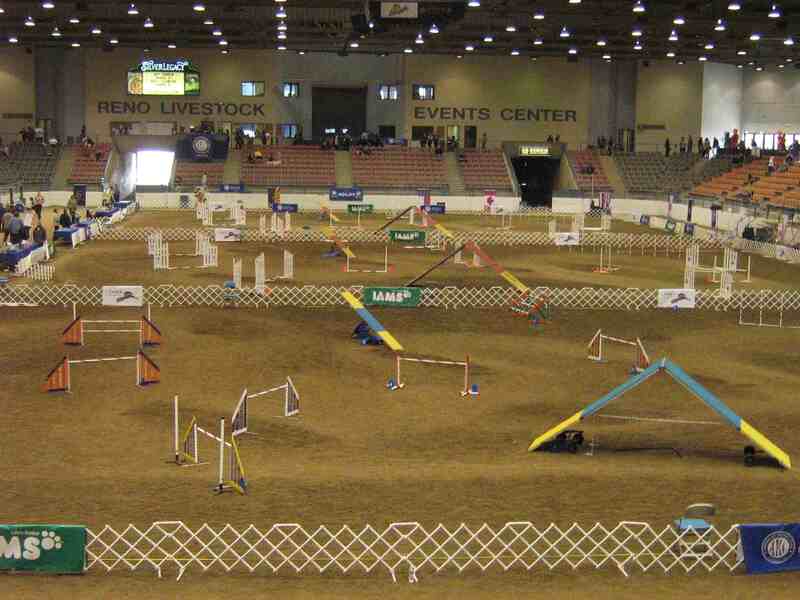 It was a quest to earn our way to the National Agility Championships in Reno. And now we’ll soon be on our way for the NAC trial taking place this weekend. 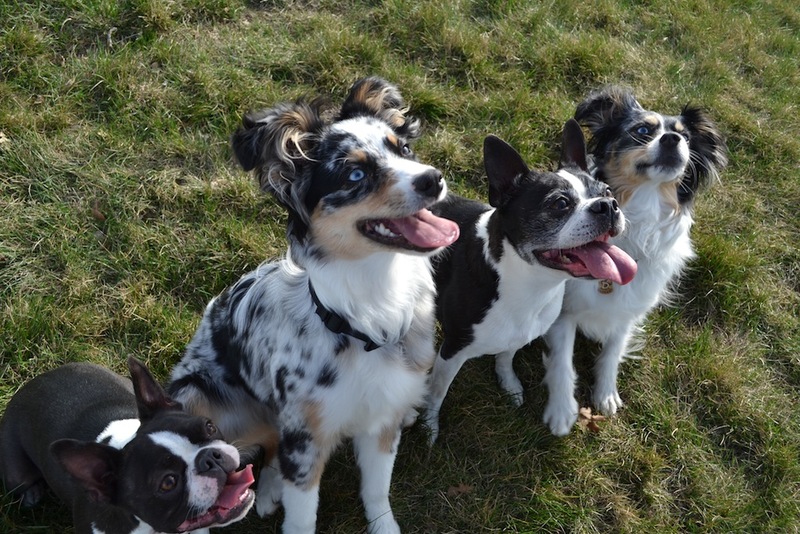 Our goal for the NAC is simply to run…to enjoy running together, and enjoy our dog and people friends. Each time Dunc sails over that finish jump, grin on his face, I will try to remember to savor that moment, knowing how far Duncan has come, how brave he’s learned to be, and how much I love running this game with my boy. I love this dog with all of my heart. Thanks for running with me, little buddy. Dunc with his "Clooney" expression...all squinty. Until recently, Des had never done more than three obstacles in a row. I’ve spent most of our time working mainly on foundation and focus, just with me. I haven’t shared a lot of Des video to date mainly because I wanted to allow him the time to find his feet, to help him decide if chasing around a field of obstacles was his idea of fun. This short sequence was part of our current lesson. I think my boy may have found his feet! 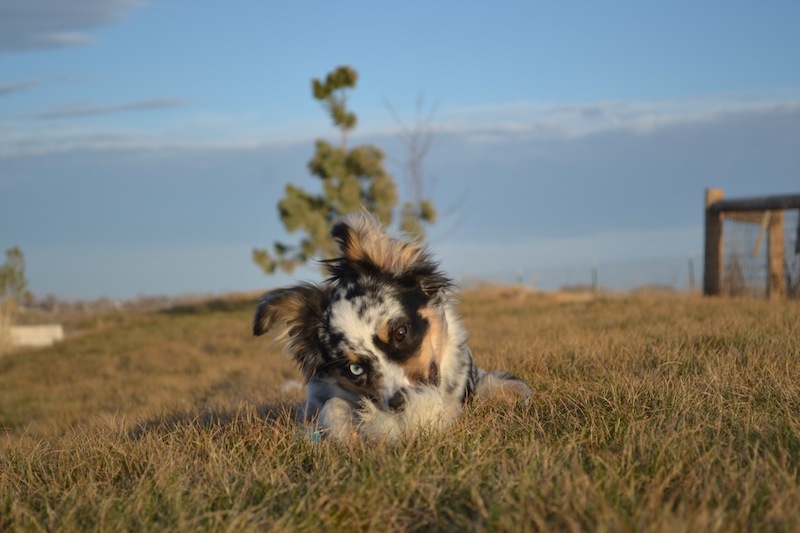 Snow, Sunshine and Dog Toys…it Must Be Spring! It’s the other kind of spring! 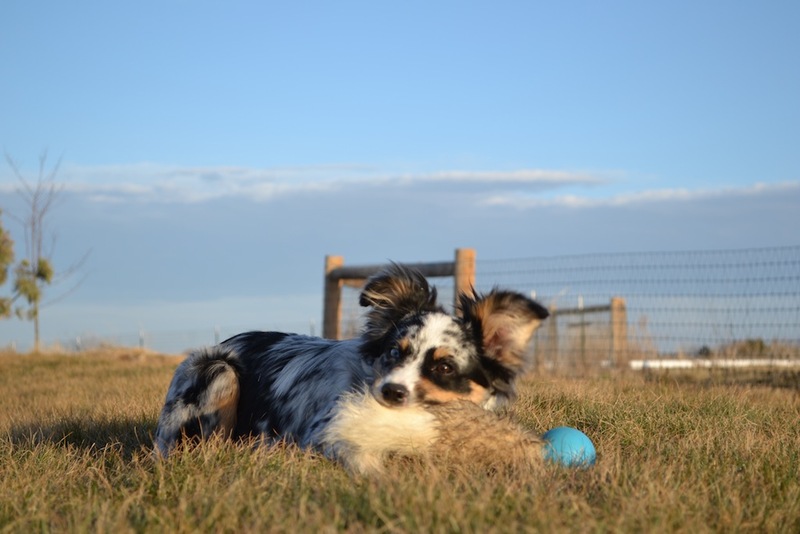 Just a boy, some newly green grass and a fuzzy-tailed squeaky ball. After grabbing the toy, lighting up the afterburners and taking a dozen hot laps around the yard, he flopped down to enjoy his prize. Duncan, in the meantime, did his best superhero pose. 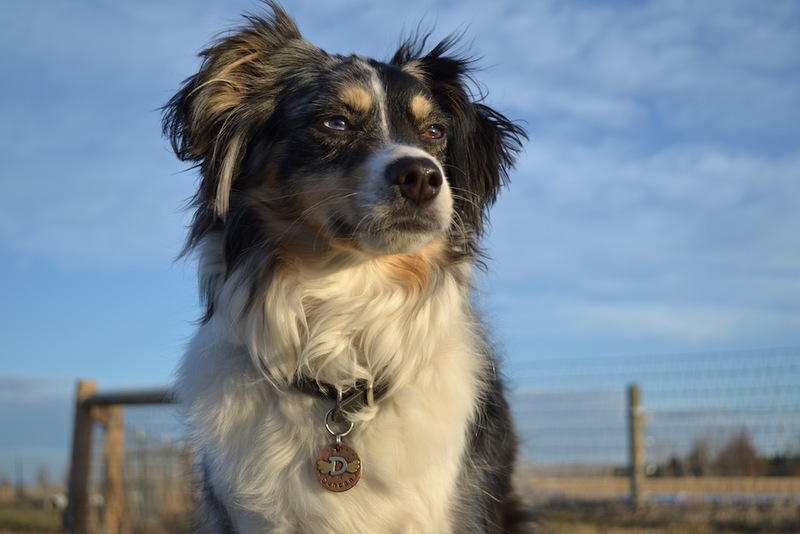 Part-time agility star, full-time protector of the yard, defender of our flock of quail from prowling cats, and our UPS guy alarm system. Little dog, big heart. As it turns out, perhaps quite literally. 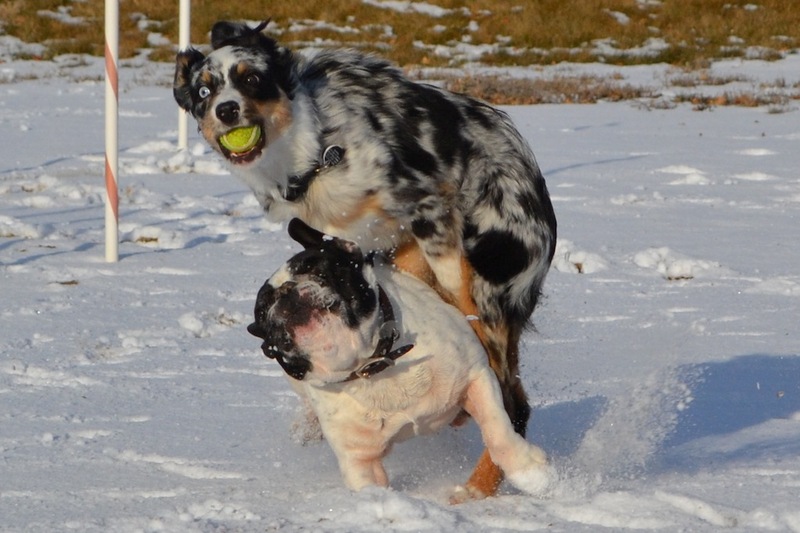 Later, Des got to play with a friend. They compared baby brother notes and found they have a lot in common. I fear we may endure some back seat hijinks later this summer if they get to ride next to each other. Watch out varsity, the JV squad is pretty cute, too! What a lovely afternoon…the Merlies and I are awfully happy to share the day with our Boston friends! Next stop…Reno!!! For those of you who have little brothers, ’nuff said. For those that don’t, never fear, about a nanosecond after I took this shot, Des turned on the afterburners and opened up a sizable lead on the bitey one. We’ve been quiet this week. To keep our summary short, Duncan and I had far too many visits to the vet, apparently to test how high my blood pressure can go. Let’s just say we’re thankful for dog doctors who love their work, and are more than willing to take enough time to get to the bottom of a problem. We begin this week feeling optimistic, and looking forward to getting seriously ripped on our therapy bosu ball. (To provide clarification; Duncan will be the one getting ripped, I will provide moral support and motivation in the form of cookies). 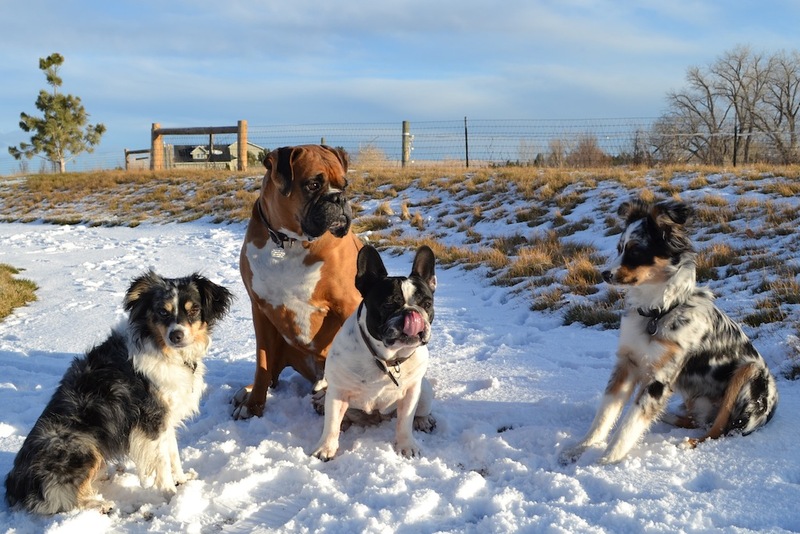 It’s been a dry winter here, so after a recent snow, the pups threatened to mutiny if they didn’t get to go and romp in it. 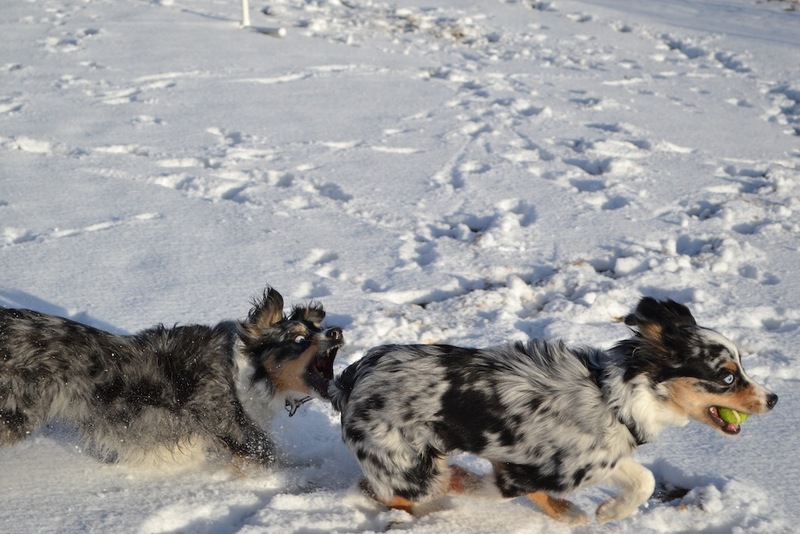 Des tried to play keep-away with everyone, but he’s far faster than the other pups now…so he spent a lot of time looping around re-engaging the game of chase. 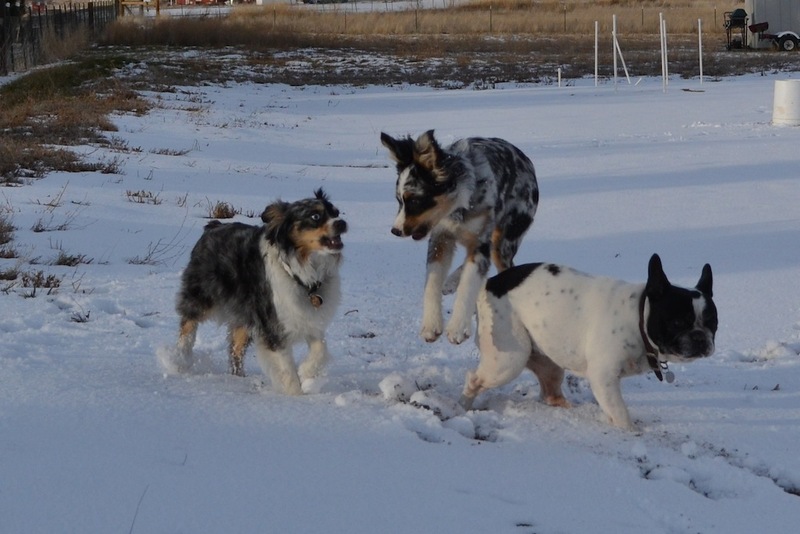 With all the training we do, sometimes it’s just fun to watch them be goofy together. I hope you enjoy their antics as much as I did! 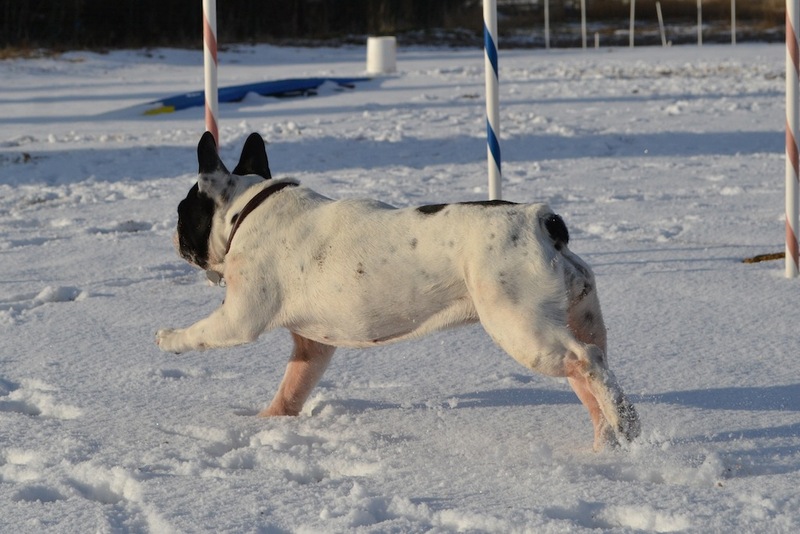 Lucy, our Frog Dog, hit the snow to show the boys how it’s done. Allez, allez, ALLEZ!! Go go GO! Tres magnifique, ma petite choux. And then Des hit a Bulldog Speed Bump. Even Angus, AKA the Big Red Truck (named for obvious reasons) joined the fun. 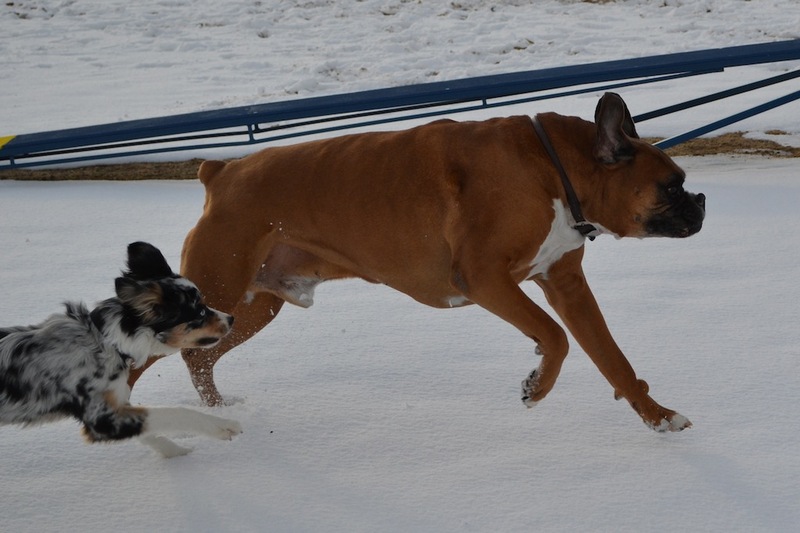 For a ten and a half year old Boxer, he’s still got some go. You can see Des wisely pace him and not attempt to pass. Sometimes the Big Red Truck gets overly excited and loses a wheel. Either that, or he’s practicing levitation. In that case…Wingardium Leviosa! At the end of the day, everybody crashed with their respective blankies, having had a blast outside. Angus, our old boy, fell asleep with a big Boxer grin on his face. And I got an hour of solace with two merlies passed out in my lap. A pretty good end to a pretty fine day. All four. In one picture. I'm so lucky I should buy a lottery ticket! February and We’re Off to the Races! 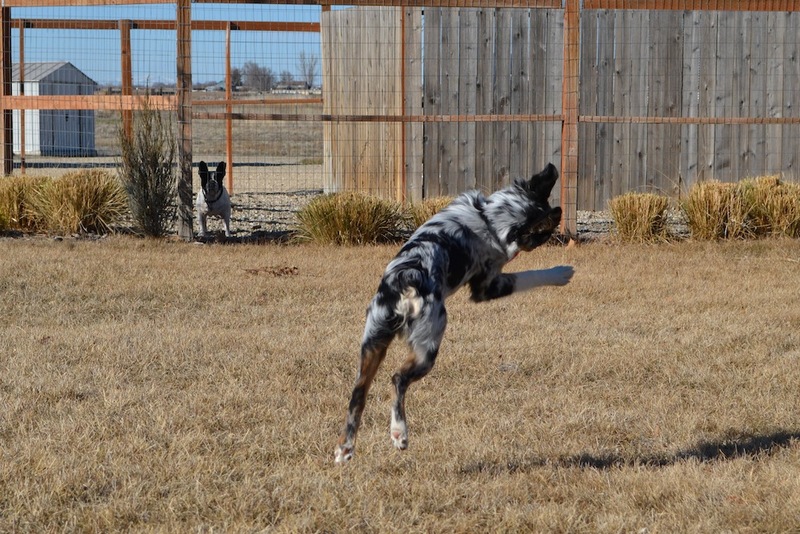 Duncan and I would like to share a few of our favorite runs from the February Lizard Butte KC AKC agility trial from about a week ago. I’d meant to post these earlier, but the Plague of 2012 (AKA a common cold) took me down for several days. On a positive note, I caught up on my backlog of National Geographics. Nothing like a mega-dose of geo-nerdy goodness to pass a semi-concious afternoon! Our judge for the weekend, Debby Wheeler, will also be a judge at Nationals in Reno. She threw a few ‘national level’ challenges into each course. Friday’s Standard course had a fun little twist at the end with a back-side finish jump. Many, many dogs had successful runs and thundered around the last bend to the finish, only to fall victim to that last jump by taking it in the wrong direction. Here is our run on that course…Dunc fired up as soon as his feet left the table. I knew I needed to buckle my seat belt and tighten my shoelaces for the dogwalk-to-finish section, and Dunc didn’t disappoint. I ran this section flat-out to encourage him to go, and GO he did! Friday’s JWW course had a nice flow to it. Dunc ran it smoothly, at a nice speed, and I believe we got a first. What I like most is I managed to stay out of his way and not do any crosses to cause him to hesitate. He did puzzle a bit over my blind cross at the beginning, but like a seasoned competitor, chalked it up to handler randomness and kept going. Our running contacts still have some way to go, but there was definite progress at this trial. Dunc is driving harder than he did just a few months ago, and as a result is learning to adjust his striding. Retraining contacts has definitely been an exercise in patience (and quite possibly sheer stubbornness) but has definitely been one heck of an interesting ride. 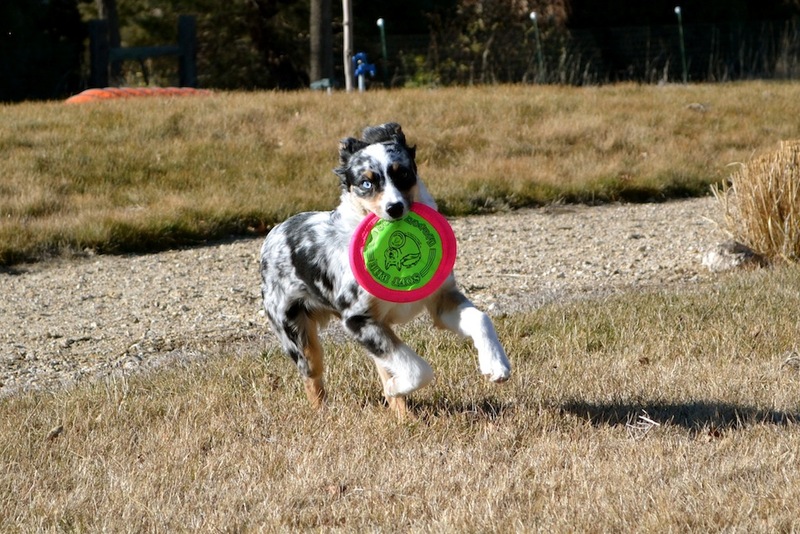 The other day, I received an email from the AKC Canine Partner program manager. 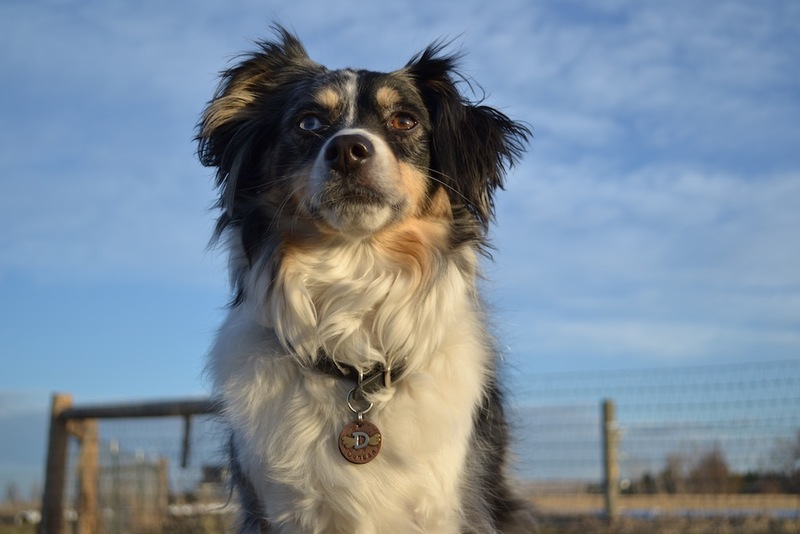 She saw that Duncan and I had qualified for the National Agility Championships, and was collecting bios on the teams who are going. 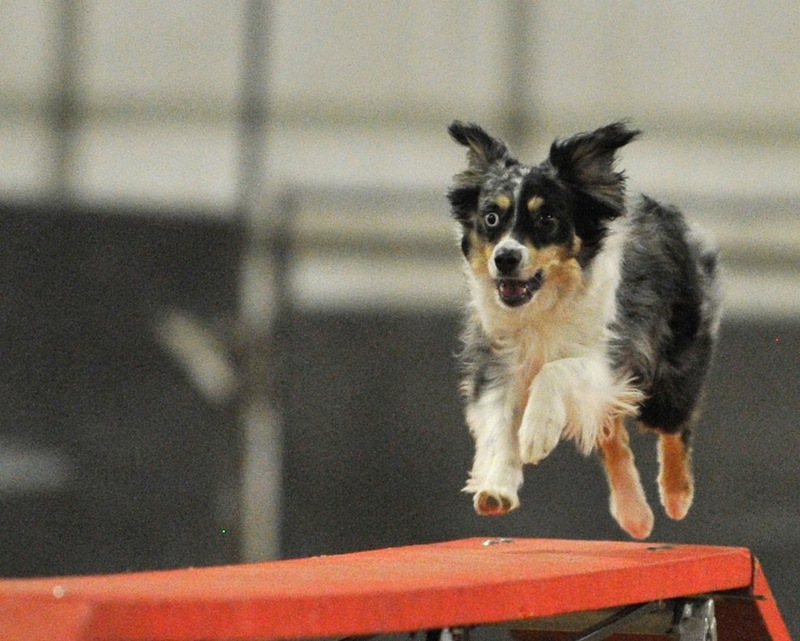 How very cool, I thought, always ready to brag on my boy, I sat down to describe our agility journey. And I got stuck. You see, Duncan is registered in the AKC Canine Partners program. 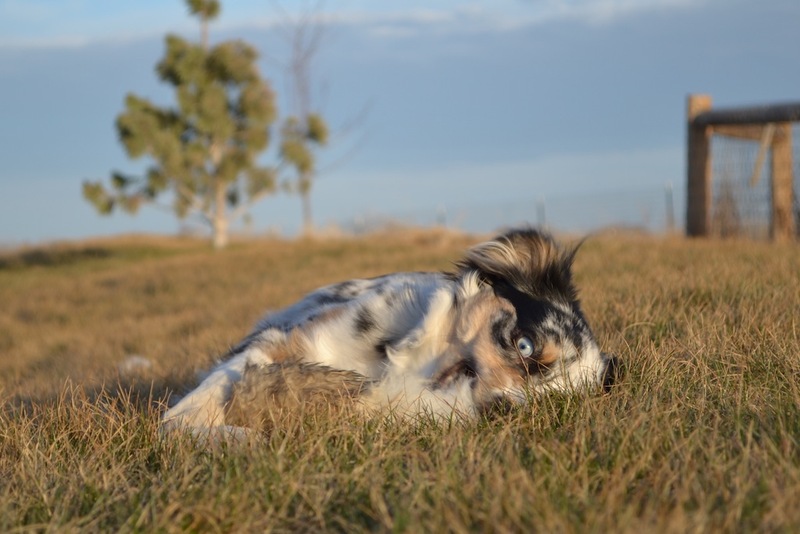 Since he’s a Mini Aussie, he was unable to play in AKC agility until 2010 when they opened performance events up to all dogs, in addition to breeds already recognized by the AKC. Being a believer in karma and good ju-ju and not wanting to mess up a nice run of good trials, I decided to keep Dunc in the Canine Partner program as we were already building MACH points and Double Q’s by this time. I didn’t want to take the smallest chance of losing our hard-earned points. And so, we qualified for Nationals. Whoo hoo! But when I tried to describe him on our bio, what do I call him ? 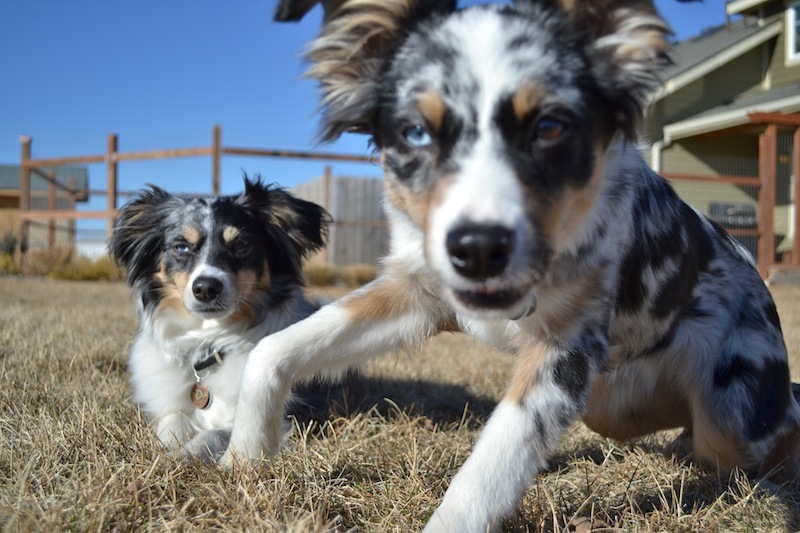 A Mini Aussie? Certainly he is, but that’s not an AKC breed, and I want to be respectful at an AKC event. Mini American? Technically, he could be, but I haven’t submitted the paperwork to change his registry, and I’m a technically correct kind of gal. All American or Mixed Breed? (as we are called on our handler stickers) That’s fine and dandy, but since he’s not (see above technical nerd reference) it sticks with me a little, just like being described as from Iowa, instead of Idaho. 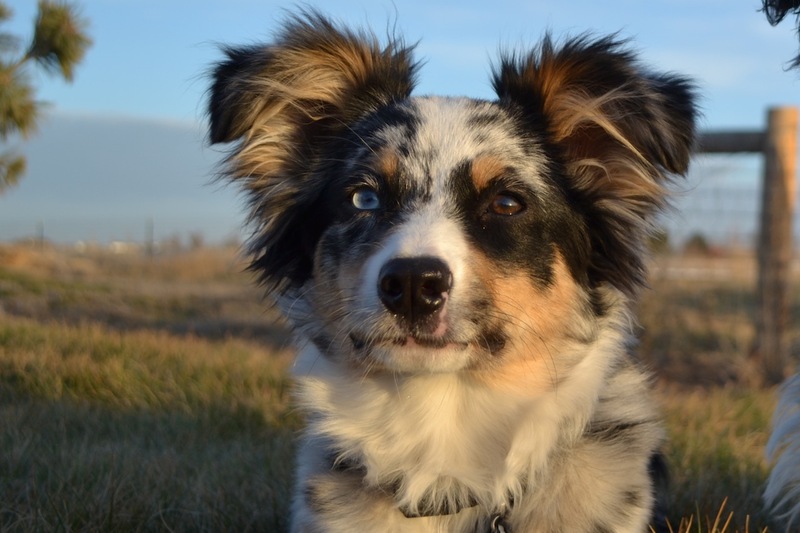 I find the whole situation pretty darned funny, since Duncan is still Duncan, and most people still refer to him as a Mini Aussie. Will I ever move Dunc to the Mini American registry? I may, or I may just let it be. 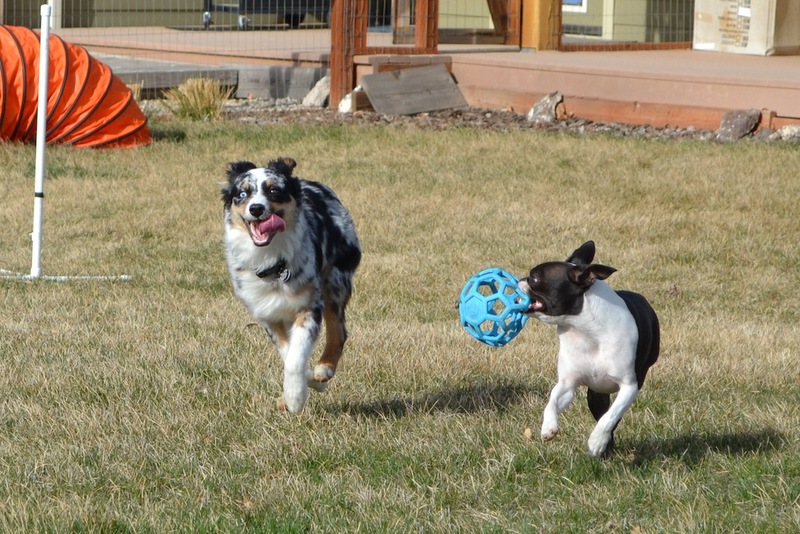 As long as I get to play agility with my boys, I’m happy. And we will continue to confuse the gate stewards who are looking for that “All American” in the run order. 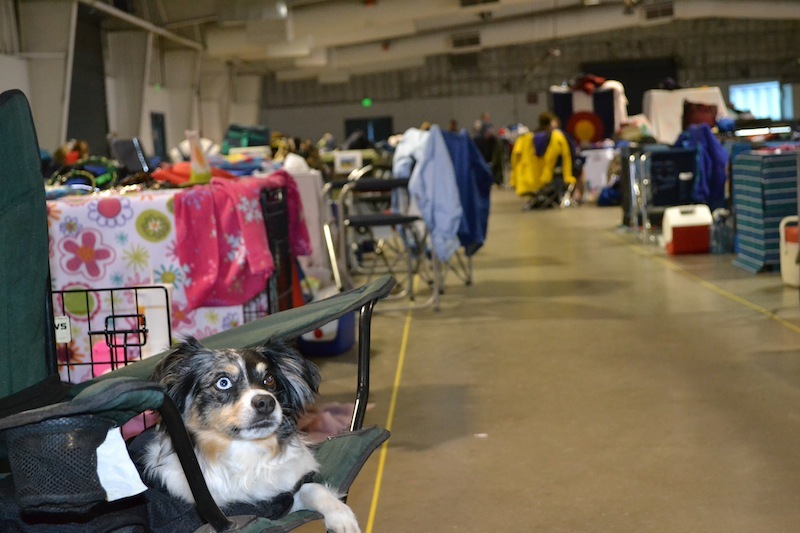 FYI: in a 12″ class of almost 200 dogs at Nationals, he’ll be the only one. And maybe Dunc will stay in the Partners program to keep Des company. 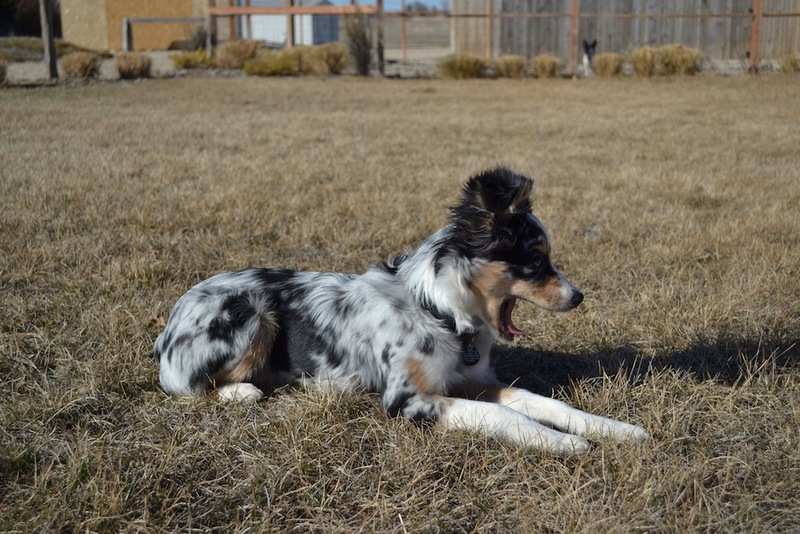 Again, without getting into the breed politics too much, at the request of his breeder, Des will remain a Mini Aussie by registry, and will not be considered a Mini American. 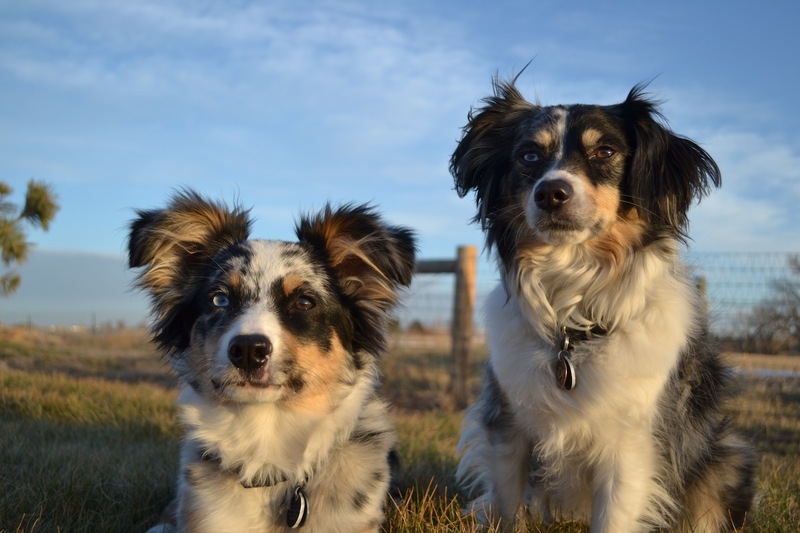 In my mind and my heart, my boys are Mini Aussies, mostly because that’s how I identified with them first. And keeping in mind how I feel about my boys, perhaps that’s how I’ll write Duncan’s bio. 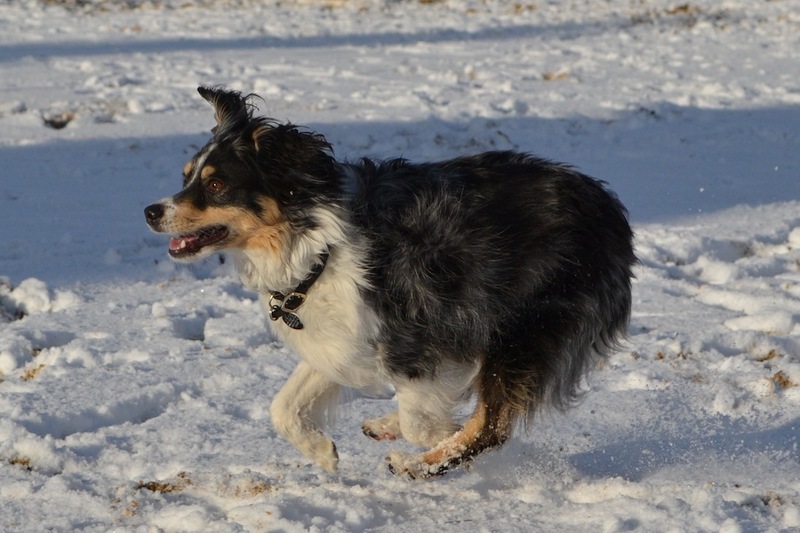 He is my four-year old heart-dog, my first agility partner and teammate. Yes, I know I’m cheesy. I’m good with it. This is bor-ing! Lets PLAY!! 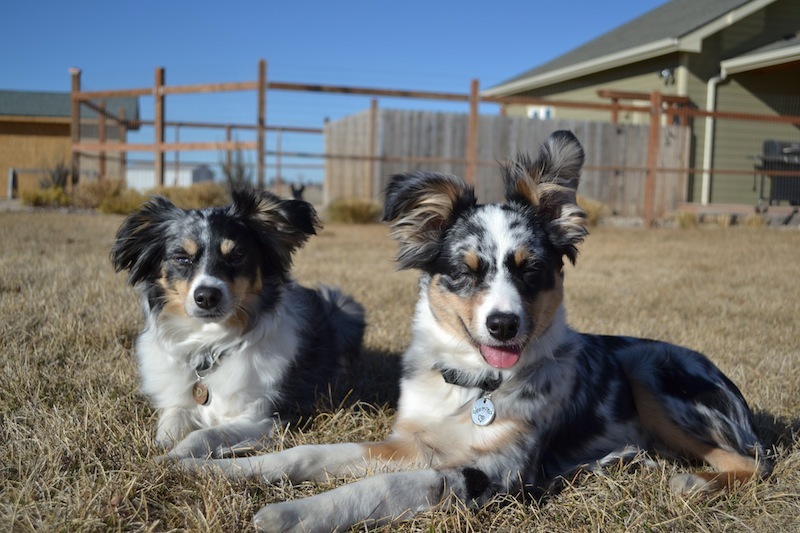 But if AKC is looking for suggestions, I have one: please consider replacing the words “All American” or “Mixed Breed” on your entry forms, gate sheets and handler arm bands with your own officially designated name for the program: Canine Partner. And let us run with our partners, pure and simple, for the joy of it. Are we done yet? Can we got play NOW? 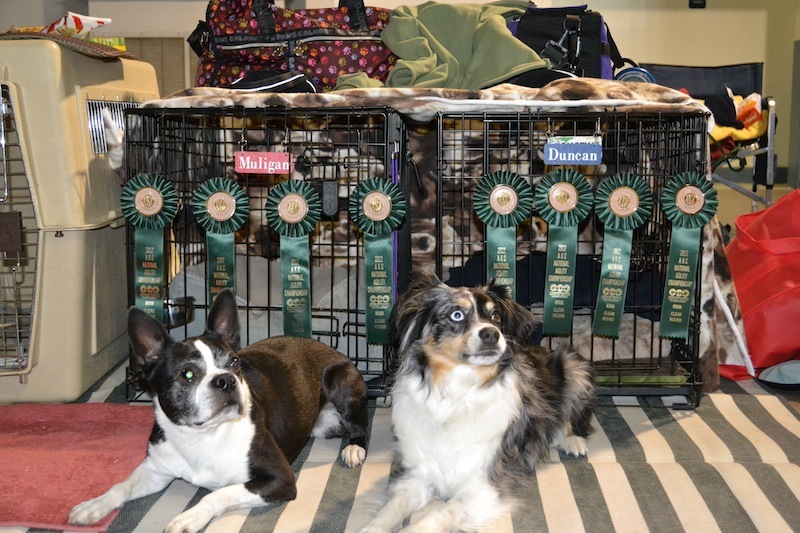 And lastly, Dunc had a lovely trial last weekend, earning another QQ. Des came with us, and was beautifully behaved crated next to his big (or should I say – older) brother.